Thank you for your interest in our software for Windows which covers a wide variety of functionality to assist iTunes, Facebook and other types of Windows users. Buy or Try (full functionality). Supports Windows 7, Windows 8 up to Windows 10. Easy to use yet full-featured Windows Maintenance and Cleaning solution to clean iTunes. Reclaim space for your iTunes Music Library! Fixed bugs (dead links problem) & supports iCloud. Removes duplicate files and missing tracks quickly and easily, including songs, movies, TV shows, podcasts and audio books. 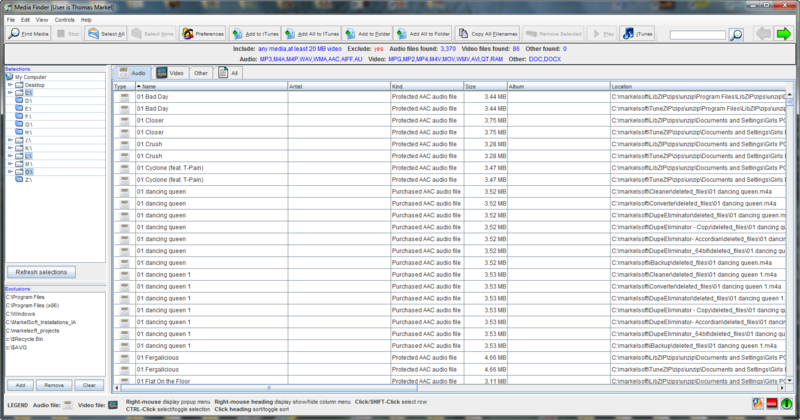 It also provides a tab for quick Library Report. Smart Searching allows you to precisely specify criteria for duplicates so that you never end up deleting something you wanted to save. AutoClean mode automatically cleans your iTunes library without lifting so much as a finger. Scheduled Search lets you define a schedule for Dupe Eliminator to check your iTunes library when you're at work, sleeping... whenever you want. Dead Track Eliminator gets rid of those pesky tracks that never seem to play, as well as "phantom" tracks that show up in your library but don't actually exist on your hard drive. Determine what you want to keep: like having more than one track of a certain song? You can keep whatever you like, and you can specify which file stays as the original and which one is marked as a duplicate. UnDelete so if you make a mistake, then use UnDelete to restore the removed track(s) back to iTunes. Your library will now be clean, optimized, smaller and much, much easier-to-use. All 10 of our popular iTunes tools at one very low amazing price. 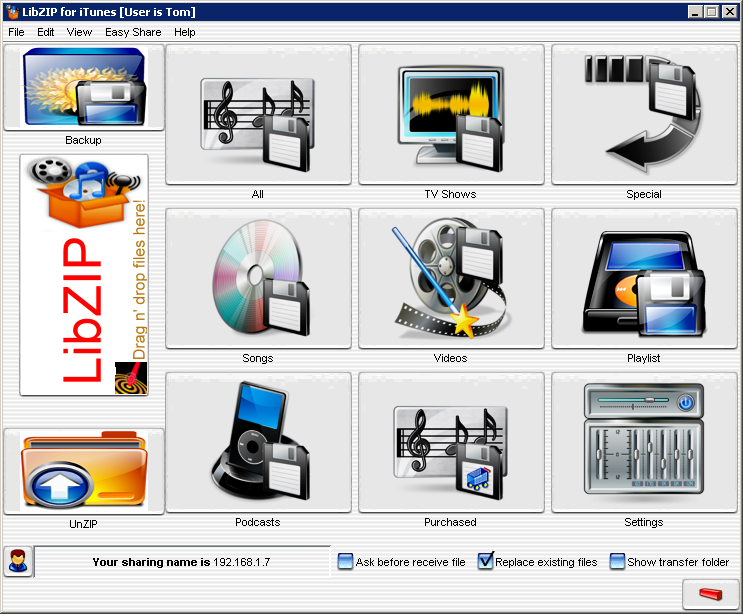 Includes Dupe Eliminator, Converter, StreamTunes, Tweet Tweet, Media Finder, LibZIP, ezShare, Library Switcher, Super PlaylistMaker and Visualizer. 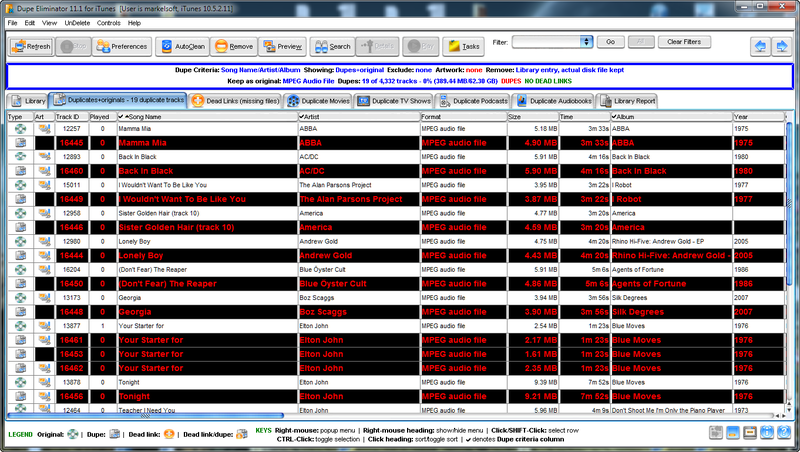 A ton of very useful software for a fraction of the list price! Over $200 worth of software at 50% off!. Find audio, video and other file types of any size. Play, delete to free space or even add media to iTunes. the results to iTunes or desktop folder (file shortcuts) or delete any of the files, if you like. Media Finder can exclude media files that are not already in your iTunes Music Library. The Media Finder can scan any of your hard drives, all of your hard drives or just specific folders that you select for any size file. You can also add exclusions if you want to exclude a drive or directory to scan. TIP: you can also add extensions such as doc to the audio and video extensions and those additional extensions will be scanned for. Run StreamTunes Media Server on your computer running iTunes then stream video, music, photos or documents using your mobile app or any mobile, PC or Mac browser. Keep all your large video files on your home PC and free up space on your mobile device! Fixed login (registration problem) and iTunes bugs & new automatic Router port mapping for Internet access. $200 worth of software at 75% off!. Chrome is great but sometimes it gets hung up or slows to a halt. When Chrome becomes unresponsive, QuickKill to the rescue as 1-click kills all your Chrome processes and tabs at once and can restart Chrome if desired. Can now kill applications other than Chrome, if desired. One of the nice protection features of Chrome is that each tab in your Chrome browser has a separate Chrome process associated with it. This works great to ensure that if one of the tabs hangs up it does not effect another tab. But if you start many tabs or have more than one tab become unresponsive, Chrome can start to drag your system. There is a pro and a con to any feature. You can try to use Chrome to kill unresponsive tabs using Chromes Task Manager or close a tab but Chrome will wait or many not be responsive at all. So what do you do? QuickKill kills any running Chrome process -- separate browser startups and all processes running to support tabs -- at one quickly and cleanly. Note: if you have anything in a Chrome browser tab in a form etc to save, QuickKill will not save this. So if you have a responsive tab with info to save, save first before using QuickKill. You can use QuickKill or QuickKill + Restart. QuickKill just kills all Chrome instanes and '+ Restart' kills and then restores one instance of Chrome. 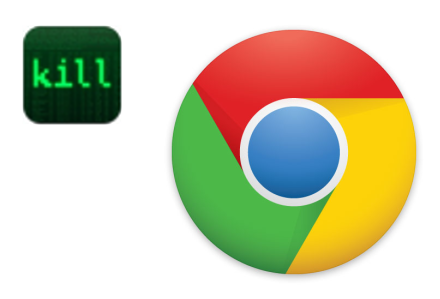 A program 'kill' icon for QuickKill and QuickKill + Restart are added to your Desktop during installation of QuickKill for Chome. Say any text in a computer voice and share an MP3 audio file of the voice! Enter any number of text messages and hear the text in a computer voice. Share an MP3 audio file of the spoken text to anyone. Send any greeting even a birthday wish. 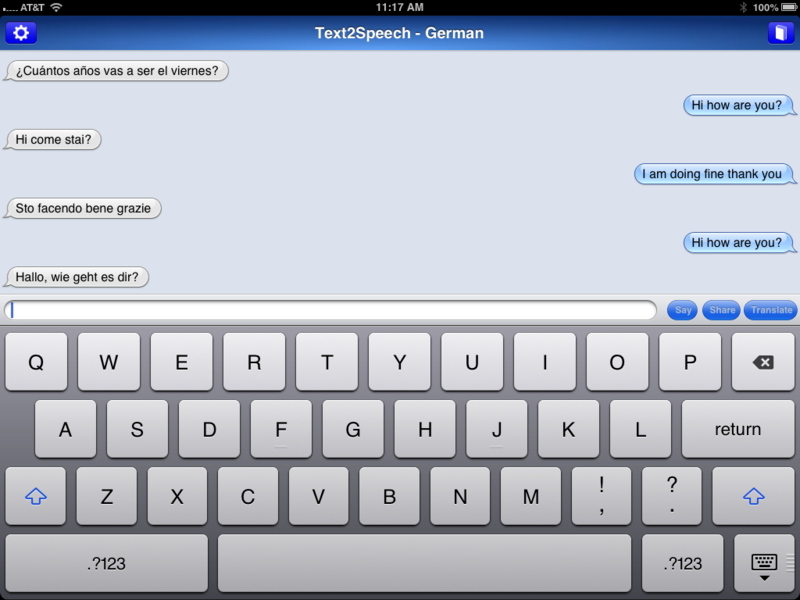 All of you text messages are automatically saved so you can resay or share in the future. Easy conversion of PC video to iPad, iPhone and iPod Touch format. Convert Windows video to iOS compliant MP4 video for iPad, iPhone and iPod Touch. Supports MOV (QuickTime), AVI, MP4, M4V, MP3, MP2 and MPG. 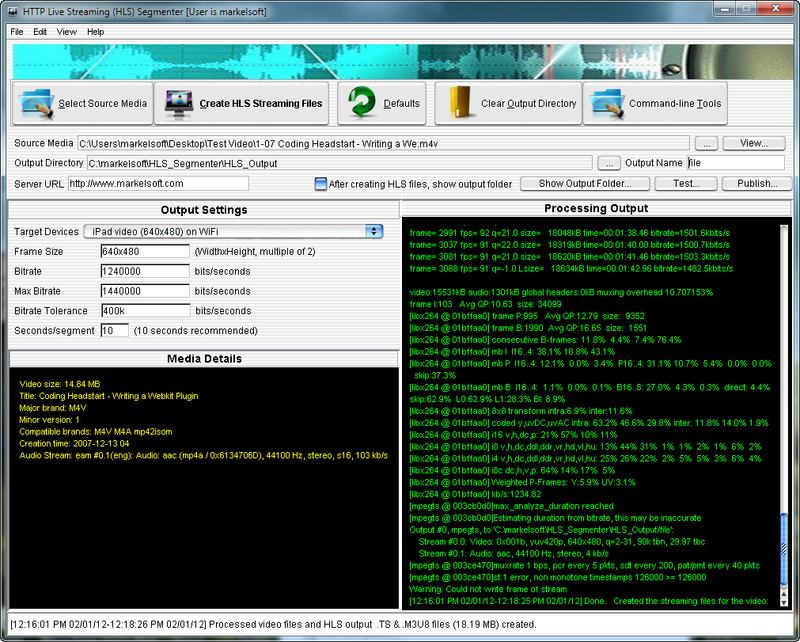 Output is in MP4 AAC format. Comes with canned settings specifically for the iPad, Iphone and iPod Touch on WiFi and 3G. Custom settings allow you full flexibility to set video frame size and bitrates. Email features lets you send an email with the created video attached. Create, test and publish, using FTP, Apple proposed HTTP Live Streaming standard video files (.M3U8 and .TS) for an iOS device (iPad, iPhone or iPod Touch) and other platforms. Do you have a video you would like to stream on an iOS device or another platform that supports the Apple proposed HTTP Live Streaming standard? Now this is very easy to do with HLS Segmenter, which comes with canned settings for the iPad, iPhone and iPod Touch devices over both Wi-Fi or 3G. Fixed bugs preventing HLS Segmenter for working correctly under Windows 10+. 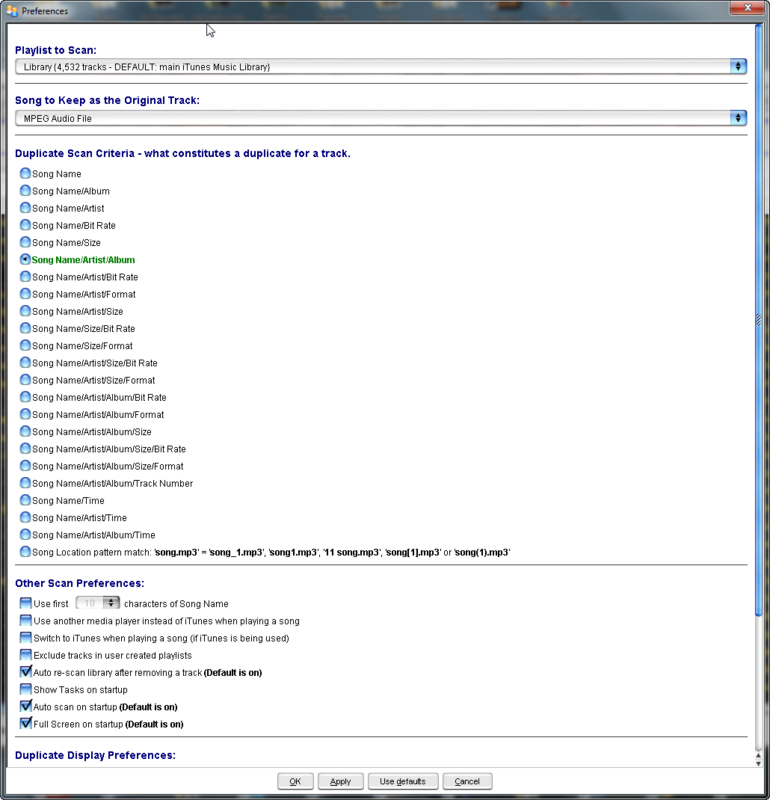 In addition, you can create your own custom settings to fine tune your output to your desires. In addition to the easy-to-use user interface, command-line tools are provided which allow you to script conversions or integrate conversions into your application or web server to provide live streaming. Optimize your library by converting songs in iTunes to MP3, AAC, WAV, AIFF or apple Lossless format. Convert your entire music library at once or convert one or more specific tracks. Optionally, can delete the old tracks once the conversion is successful. 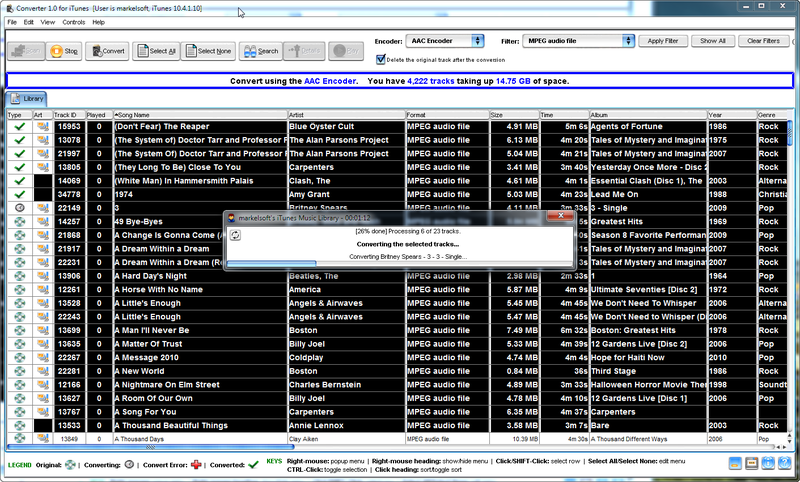 Have a ton of AAC quick files that you want to be in MP3 format or a ton in MP3 format you have in AAC format. Whatever, convert them all at once or convert five tracks to one format and five tracks to another. Very flexible and fast. Zip up your entire music library or a specific playlist. Transfer music from one PC to another. Options including backing up iTunes Music Library, zipping full iTunes Music Library, zipping songs, zipping movies, zipping videos, zipping podcasts, zipping TV shows, ziping a playlist and zipping using a file pattern. Also includes compression options and ability to specify a zip folder location. Drag n' Drop your iTunes Music Library tracks from one PC to another. 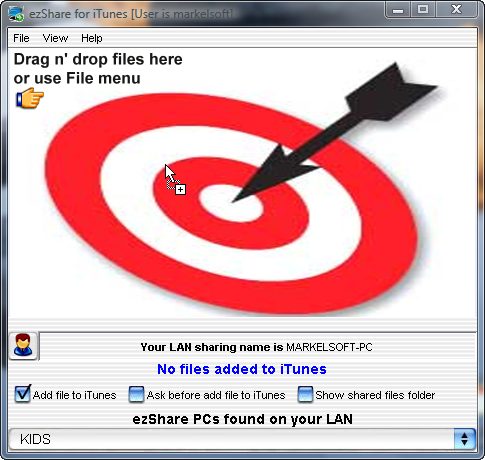 Easily share any tracks from your iTunes Music Library or files or directory of files with another PC. Tracks that are shared are automatically added to the receiver iTunes Music Library, if desired. Easily switch between and manage multiple iTunes Music Libraries. Allows the user to create new iTunes Music Libraries and switch between existing and new libraries. Also has the ability to create a desktop shortcut for switching between libraries. Create separate libraries on the same PC for multiple users or organize your music into separate libraries. Add 8 new powerful playlists to iTunes including 'By Artist', 'By Album', 'By Genre', 'By Kind', 'By Play Count', 'By Rating', 'By Size' and 'By Year'. Want to find everything you have by 'AC/DC', a specific album by Eminem, all your audio books, Classic Rock tracks, tracks played more than once or played more than 100 times, tracks with a sizes < 1 GB or < 1 MB, your 5 star tracks or all your tracks from 1985. You name it. Run this program and you have it all at your fingertips. Visualize and explore your iTunes Music Library. 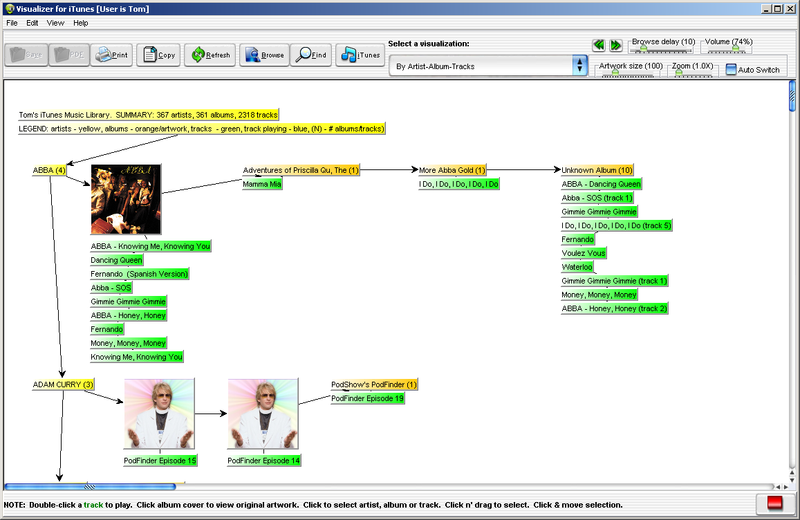 Tree-based view showing albums and tracks for each album. Live albums and tracks so can play and explore right from the view. 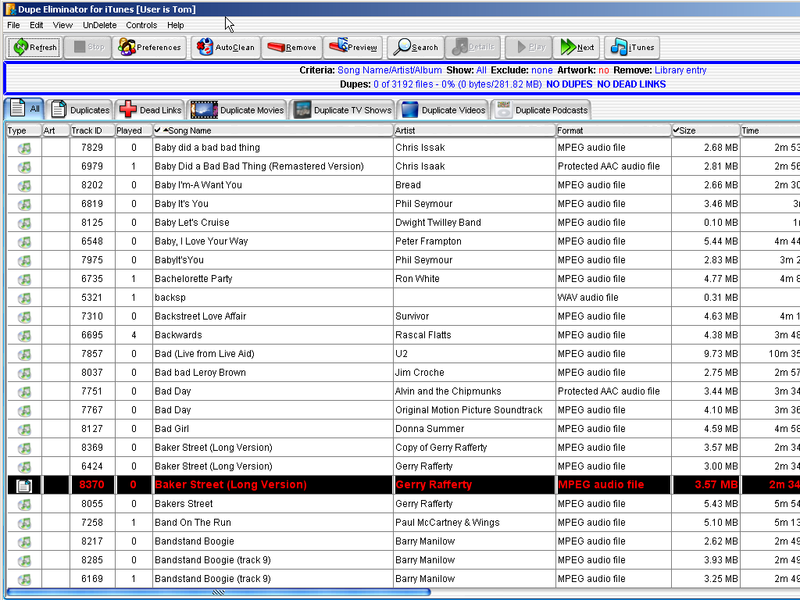 Additionaly views and charts showing a welth of information on your iTunes Music Library.